Home News Reports 9 years after Pakistani terrorists gunned down his parents, 11 year old Moshe returns 'home'. Moshe turned 2 on 28th November, 2008, hours after terrorists from Pakistan killed his parents in Mumbai’s deadly attack lasted 60 hours, killing 166 people. His parents, Gabi and Rivka Holtzberg were killed in Chabad House, a Jewish cultural centre. When the terrorists gunned down his parents, during the well coordinated attacks, Moshe was saved by his nanny, who found him standing near his parents’ unconscious bodies. Six months back, when Prime Minister Narendra Modi visited Israel, he met Moshe, and invited him and his family to visit India any time they want for any period they want. In an emotionally charged meeting, Moshe had expressed his love for India and Prime Minister Modi and expressed his desire to visit the place he spent his childhood, which he could vividly remember. Israeli Prime Minister, Benjamin Netanyahu, who was present during the meet, asked Moshe to come with him when he visits India in few months’ time. Today, Moshe returned to Mumbai. 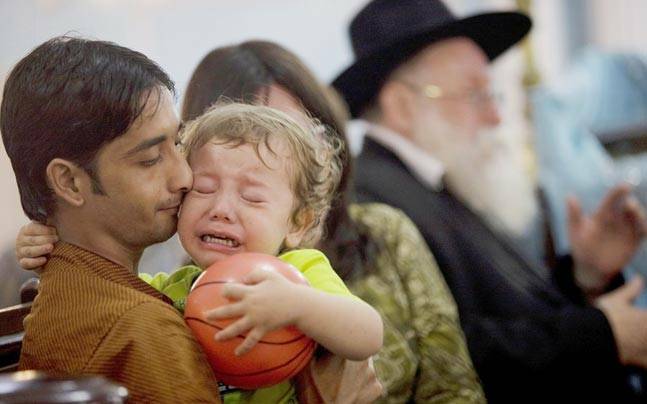 “Shalom… bahut khushi (I’m very happy),” said a shy Moshe, who arrived at the Mumbai airport shortly after 8 am. He is visiting along with Israeli Prime Minister Benjamin Netanyuhu, who is on his maiden visit to India, and will fly back with Netanyahu on 19th January. Accompanying Moshe is his former nanny, Sandra Samuels, who saved his life. Samuels, who was awarded an honorary citizenship by the Israeli government so that she could live in the country and be with Moshe, continues to share a unique bonding with the little boy. India has issued long term visa to Moshe and his family so he could visit India any time he wishes. He remembers his connection to the Nariman House, which was left bullet spoked after the terrorists, whom Times of India referred to as gunmen, took under siege. He even said when he grows older, he wishes to come and stay here in his Mumbai home.